In Iran, 27 year old Meryem Rostampour and 30 year old Marzieh Amirizadeh Esmaeilabad (see the above photo) will be put to death on charges of having changed their religion. 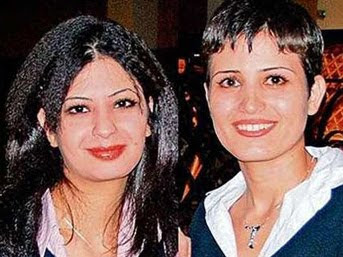 Since March 2009, both Meryem and Marzieh are being detained in Tehran’s notorious Evin prison. First with 25 women in one (!) cell, then in solitary confinement, where they were interrogated while blindfolded. Their crime? They were Muslims and they converted to Christianity. The fact that we find particularly worrying is that there is an ongoing investigation against Mariam and Marzieh, for «apostasy». The provision of Iranian law for cases of abandoning Islam is life imprisonment or the death penalty. The 9th of August 2009 was the first day in court. Haddad, the deputy prosecutor insisted with great pressure that the women should renounce their Christian faith, both in writing and verbally. According to secure information, it was a moving sight, how the two women persisted, even with Mr. Haddad, and repeatedly stressed that they did not regret anything and would not recant their faith in Christ. This page includes a form via which you can send protest e-mails to the Permanent Mission of the Islamic Republic of Iran to the United Nations (iran@un.int) to the Embassy of the Islamic Republic of Iran in Bruxelles (secretariat@iranembassy.be) and to the Embassy of the Islamic Republic of Iran to the U.K. (info@iran-embassy.org.uk.) It is enough to submit your message ONCE for all three destinations.